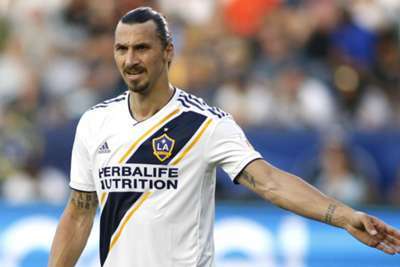 Zlatan Ibrahimovic will not be re-joining AC Milan in January after keeping his word about a renewal at LA Galaxy, the Serie A club's sporting director Leonardo has confirmed. Ibrahimovic enjoyed two years at Milan from 2010, initially joining on loan from Barcelona before eventually signing a permanent deal. The Swede was a revelation in his one season as a Milan-owned player, scoring 28 times in 32 Serie A games. Now 37, Ibrahimovic had been linked with a return to Milan having made a strong impact in MLS. But Milan will have to consider other options, as Leonardo understands Ibrahimovic has opted to remain with the Galaxy. "Ibrahimovic won't be returning to Milan," Leonardo told Sky Sport Italia. "He gave his word to LA Galaxy that he would renew his contract. "We thought about bringing him back and he thought about it too, but he is keeping his word and will stay in MLS. "He always said from the start that if Galaxy satisfied his conditions, then he'd stay. They are doing that and he will stay there. "It would have been a marvellous story and a strong signal of intent [from Milan], but it won't be possible."